This winter has wreaked havoc on my skin. I have really dry, sensitive skin. I have pretty severe eczema too so that makes it tricky when it comes to what I can put on my skin. This winter lotion just wasn’t cutting it. I tried oatmeal lotion, shea butter, the works and I still felt like my skin was just going to crack and fall off. 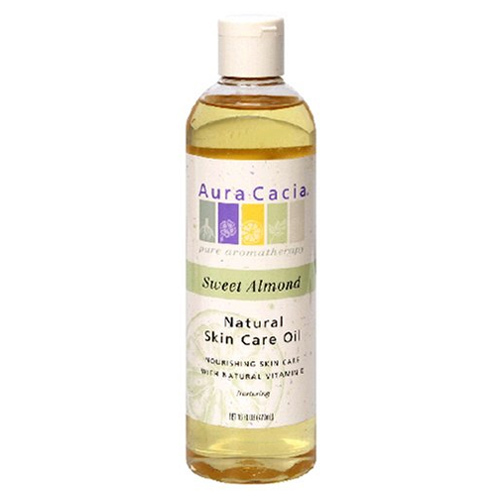 Then a friend told me about Aura Cacia almond oil. I ordered a bottle from Amazon since searches of my local grocery didn’t turn up any almond oil. Plus I wasn’t sure if I could use food grade almond oil or if it had to be just for skin. Anyway, my oil came in and it’s amazing! A little goes a LONG way. Thank goodness because I was not crazy about the price (about $11 for the bottle), but if it lasts a long time then it’s worth it. It absorbs (unlike baby/mineral oil), doesn’t have a smell (so it doesn’t clash with my perfume), and doesn’t leave me looking greasy. My Aunt Marsha told me she uses almond oil from the grocery store and keeps it in the fridge. I’ll try that once my bottle of Aura Cacia runs out. So if you have dry, sensitive skin- run out and get you some almond oil. It’s even helping my eczema!